NORTH BRUNSWICK, N.J. (AP) – For millions of Muslims, the holy month of Ramadan marks a time for ritual fasting during the day and, often, a large meal with friends and family after sundown. For those buying and selling ritually approved halal meat, it’s a time to pay close attention to ensure the food the observant are eating is exactly that. It’s harder than it sounds. Not only is it difficult to regulate, but some critics raise questions about whether the doctrine of church-state separation means governments should even get involved. That means policing is sometimes up to the meat sellers themselves as demand for halal products grows in the U.S. along with the Muslim population. 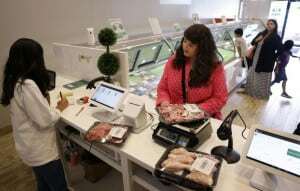 Gul Muhammad, who opened a halal meat shop in New Jersey this year, said he visits farms and slaughterhouses himself to make sure the animals are being slaughtered according to the religious standards generally adhered to by the world’s estimated 1.6 billion Muslims. Observant Muslims aren’t supposed to eat pork or drink alcohol, but there is a range of opinions on what is considered halal; for instance, some Muslims are OK eating poultry killed by machines, and some aren’t. The USDA inspects products made from ritually slaughtered animals – both halal and kosher food that meets standards of Jewish law – but leaves decisions on whether the ritual is acceptable to religious organizations that certify meat as halal. There is also a growing group of Muslims, like Aftab and Muhammad, who value how animals are treated before they are killed as much as how they are killed. Hamzah Wald Maqbul, of the nonprofit Halal Advocates, said that the intricacies of halal and separation of church and state make it difficult for the government to fully prosecute fraud. New Jersey adopted the Halal Food Consumer Protection Act in 2000, requiring halal food sellers to disclose information, including whether they sell both halal and non-halal food. It put out a reminder last week reminding businesses and consumers of the law, which includes fines as high as $10,000 for first-time offenders. Nine states now have similar laws, including New York, which requires halal establishments and certifiers register with the state. New Jersey regulators have visited more than 600 halal businesses since 2013, according to the Division of Consumer Affairs, but have not issued any violations. There is no known public database of violations for selling non-halal meat as halal. In November 2011, a supermarket chain in Anaheim, California, paid $527,000 after it sold regular meat as halal, and a wholesaler in England was fined nearly $100,000 last year after investigators caught the company putting the halal label on chicken that was traced to a supplier that did not sell halal meat. Late last year, the owners of a halal beef supplier in Iowa were charged with selling $4.9 million in beef that prosecutors said did not follow the halal practices it promised. A manager pleaded guilty to directing workers at the Midamar Corp. to repackage beef products from a slaughterhouse that wasn’t approved for export to Malaysia and Indonesia. The company has denied wrongdoing and moved to dismiss the case, arguing the charges violate the First Amendment. Islamic Services of America, which certified halal beef for Midamar, said the U.S. government can’t enforce religious slaughter protocols.